The 3 young colts (Nuggett, Socks & Pedlar) were constantly running around, play fighting with one another & trying their alpha male tricks. There was always time for a caper with Hughie too. Although Hughie is a few years older he's a big kid at heart & enjoys nothing more that galloping around their field with the occasional buck & whinny of delight. Socks was only shown once that year due to personal & work commitments. 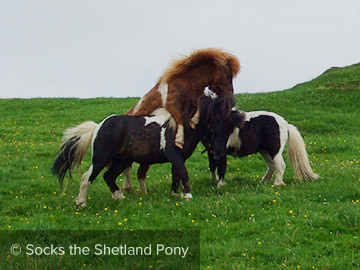 His outing was to the Viking Shetland Pony Show, the only Shetland pony show dedicated to the breed in Shetland. He came 2nd in his class that day.